I teach kids who arrived here yesterday. If their test scores don't pass muster, according to the bill the Assembly passed with heavy hearts, I cannot be an "effective" teacher. Interestingly, the tests they use for my kids have evolved too. 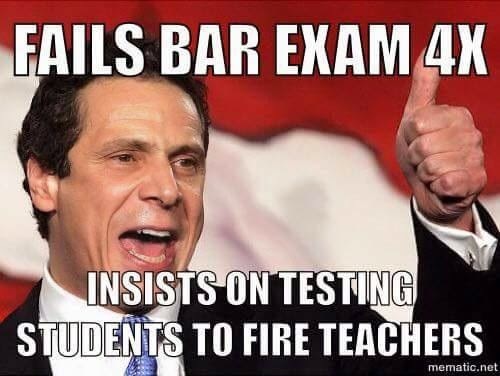 My colleagues tell me that the NYCESLAT test, designed to determine which level our students are on, is now based on Common Core standards. I went to workshops last summer with paid "experts" who could not identify appropriate Common Core standards for my students. After a while, they suggested I use elementary standards for my high school kids. It was ridiculous. For years I've been hearing talk of how we should differentiate instruction, and judging teenagers by elementary standards seemed, at best, less than ideal. I know exactly how my kids would feel about that. They'd feel belittled, insulted. I feel the same way. Teaching English to language learners is completely different from teaching it to native speakers. NYSED doesn't know that because they are ignorant of language acquisition and don't care enough to learn or even consult with experts. I'm not an expert, but I know that close reading is not a skill most of my students need. In fact, in time their reading abilities in their first languages will transfer to English. The question is--how much time will it take? It's tough to say. Acquisition of a language is quite different from studying geometry. It's not really about sitting down and memorizing formulas or rules. A lot of it is about how kids feel. Kids dragged kicking and screaming from their home countries learn English more slowly than kids who are happy. Kids who've been taught that school entails sitting down, shutting up, and regarding teachers as deities tend not to participate. And language, despite what NYSED may believe, is all about participation. How much time do we devote to speaking and listening as opposed to reading and writing? I'd argue most of it, and I write just about every day. Most people write less than I do. Native speakers know the rules of their first languages perfectly. There are those who argue that native speakers make mistakes, but they don't. We speak what we hear, and that will vary depending upon where we come from. Anyone who tells you the grammar book is the Ten Commandments doesn't know much about grammar. There are two types of grammar--prescriptive, in which you do whatever the grammar book dictates, and descriptive, in which you describe the way living people use living languages. My students arrive with little knowledge of living grammar. Some of my students have five or ten years worth of studying English, and know how to do nothing but take tests. I'd argue that, or even knowing how to read a language, is not a highly practical skill if you're going to make a life in a place where that language is used every day. So the thing is this--I MUST show these kids the rules, or they will have to pay to learn them elsewhere. I MUST make them speak up, or they will be unable to manipulate their way through our society. I don't care what the Common Core advocates say. They don't know what kids with whom I've worked for decades need. They have manuals and checklists, but I have experience. I realize there's not much of a premium on that nowadays, particularly if your experience is in teaching. I'll continue to help these kids for as long as I can. It's clearly the goal of Cuomo and his heavy hearts club legislature to make that as short a run as possible. Nothing to do now but fight him, and the first step is waking up to do our jobs every working day.